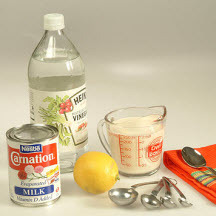 A great alternative to buttermilk to give your recipes that desired tang when you don't have buttermilk on hand. Measure evaporated milk into glass measuring cup. Add water and vinegar; stir. Let stand for 5 minutes before using it in a recipe.